Amethyst Amethyst is a variety of quartz and varies in color from pale lavender to a deep, rich purple. Users of this powerful crystal believe that amethyst operates on levels that are out of our normal range of senses. Amethyst has been often given away as a symbol of sincerity. It is said to lend a feeling of security and contentment. Adventurine Adventurine (Aventurine) is a good luck stone, especially in financial matters. Adventurine stimulates creativity, intelligence and perception. It is a great healing stone and it gives a sense of mental and emotional well-being. Citrine The Stone of Success. Citrine is a quartz crystal, which varies in color from pale yellow to deep amber. People are drawn to the golden citrine for the courage and self discipline it offers. The colour yellow is the colour of logic and the intellect. This stone brings joy , and optimism in to your life. Lapis Lazuli The Stone of Friendship and Truth. For many people all over the world Lapis Lazuli is considered a stone of universal truth and friendship. The blue stone is reputed to bring harmony in relationships and to help it’s wearer to be an individual. Hematite The Grounding Stone. Magnetic hematite is known for memory enhancement, original thinking , and technical knowledge. It aligns subtle bodies , meridians and spines. Hematite is said to calm and soothing qualities. Rose Quartz The Heart Stone. Rose quartz varies in color from peach to pink and it is, of course, part of the quartz family. Quartz The greatest of all healing stones. Quartz acts as an amplifier for psychic energy and aids meditation and visualization. Tiger's Eye Tiger eye enhances insight, clear thinking & good judgement. Turquoise A healing stone. Turquoise attracts friendships, luck, and happiness. Releases shame and guilt. 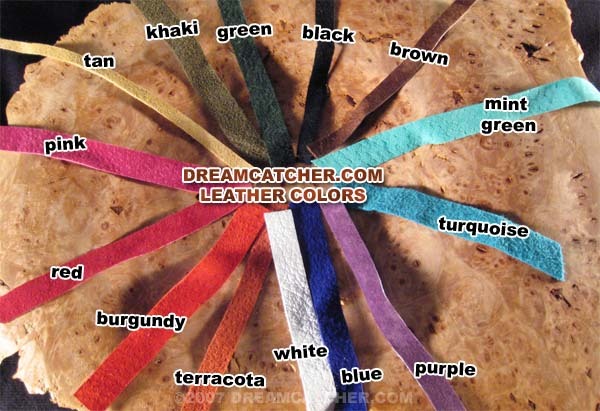 At Dreamcatcher.com we offer a variety of wonderful colors for our gifts. Leather is a natural material it is subject to variations which occur in the dying process. Sometimes colors will come out slightly lighter or darker from batch to batch. We feel that this slight variation adds to the uniqueness of each item we sell. 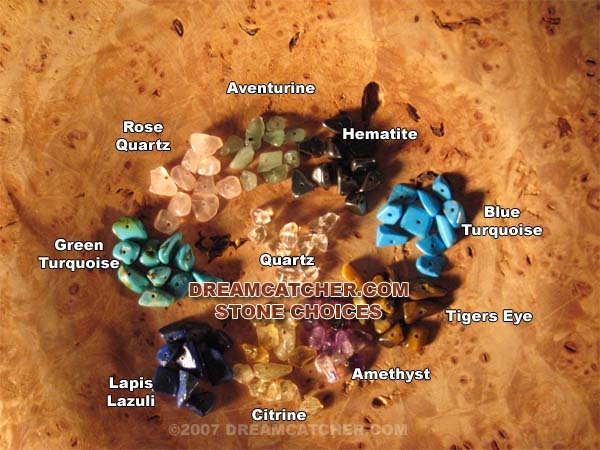 This color list is not exaustive and most items we sell have pictures of each variation of color and stone.